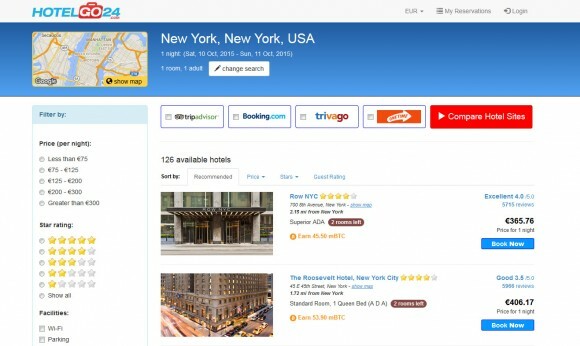 HotelGo24 a new and interesting online hotel booking service which offers a Bitcoin cash back for every reservation you make while you are traveling in your own country or around the world. HotelGo24 provides an extended base of accommodation, including 130000 hotels, located in 20426 cities from 198 countries. Customers can enjoy simple and user friendly interface, attractive prices for accommodation and Bitcoin cash back bonuses. The Bitcoin cash backs range in amount from about 1 Bitcoin cents to a few cents, depending on the rate of the hotel and what you are essentially getting with this is even better final price for the hotel you book. So the next time you need to book a hotel you might want to give the service a try and see if it will be able to offer yo a better deal than any other similar service without Bitcoin cash back option that you might be normally using. And while the integration of Bitcoin for cash back discounts on booking is definitely nice, what the service is also missing is the option to pay for your booking with BTC in order to attract more crypto currency users.